Sign Up Today and we will email you about new products and special offers! We keep the bees and the bees keep us. 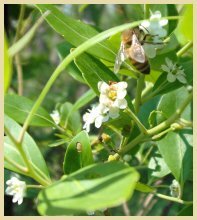 Gallberry Honey is now available! Jon and Cheryl Kittrell are beekeeper and wife who produce honey, soap and beeswax candles from their beehives. The honey and beeswax they harvest is bottled or handcrafted into artisan soap using the best ingredients. Beeswax is poured into pillars or hand-dipped into dinner tapers. These beneficial products of the hive are local, pure and natural. "The Daydream is truly a dream we have to provide a sustainable living and produce something which we believe in which benefits others as well." 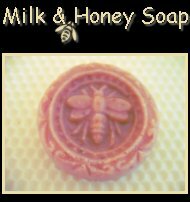 Kittrell’s Daydream Milk & Honey Soap includes the best ingredients for a bar that smells great and feels better. 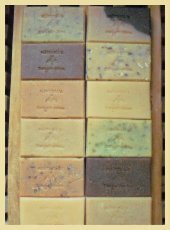 Kittrell’s Daydream Milk & Honey Soap is the blue ribbon winner in the soap category at the past two Alabama Beekeepers Meetings. 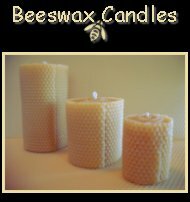 Pure Beeswax Candles are valued for their hypo-allergenic, long-burning qualities & natural warm tones. They are unscented yet retain the scent of warm honey while burning which is ideal for sensitive environments. They have long been used by churches for purification and symbolism. Pure Beeswax Candles are available in boxes, pairs or pillars. 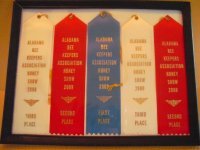 Kittrell's raw honey has won ribbons at the Alabama Beekeepers Association Meetings in 2009 & 2010 and Kittrell's handmade soap won blue ribbons at the same events. 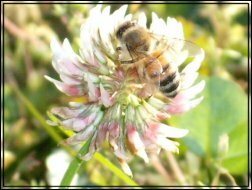 Honeybees are important pollinators in our food chain, in fact they are responsible for one-third of our food so remember to Bee Thankful. Copyright © Kittrell's Daydream Apiary. All Rights Reserved.